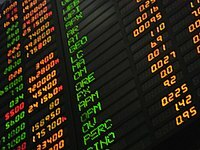 The Market Identifier Code (MIC) (ISO 10383) is a unique identification code used to identify securities trading exchanges, regulated and non-regulated trading markets. The MIC is a four alphanumeric character code, and is defined in ISO 10383. by the International Organization for Standardization (ISO). For example, trades that are executed on the US NASDAQ market are identified using MIC code XNAS. ISO 10383 is the ISO standard which "specifies a universal method of identifying exchanges, trading platforms and regulated or non-regulated markets as sources of prices and related information in order to facilitate automated processing." The FIX Protocol uses MICs to represent values of the Fix Exchange data type. Markets of various asset classes, including equities, options and futures apply for MICs through the ISO. New MICs are added frequently and the latest published list is available at the maintenance organization of ISO 10383.